Osel Hita with Anila Ann at Vajrapani Institute, May 2010. For 40 years, Ven. Anila Ann McNeil has been serving FPMT and benefiting those around her. Recently Mandala spoke to her about her life, her ordination and her experience being a nun. Mandala: How long have you been ordained? Anila Ann McNeil: Since 1970, about 40 years total. There was a six-year break when I came home in the late ’80s to be near my aging mother and father, in Vancouver, Canada. M: Why did you decide to ordain? AA: I decided to ordain (although I was not exactly sure what that meant) when I met Lama Yeshe at Anila Max’s house in Kathmandu and knew he would be a fantastic teacher. To me, joining the Tibetan maroon army meant I would receive more incredible teachings that I had been longing for since my high school president so kindly explained what psychology was all about. I had gone through periods of reading about it, but a lot seemed to be missing. But two meetings with Lama Yeshe did it. In the first, he taught a short meditation watching for something. The next time I met him, I said I was getting his visualization mixed up with others. He said that’s alright and that he had another one for me. He brought out a wrapped long Tibetan book and explained that it was all in Tibetan but not to worry and just meditate. So, I just closed my eyes and listened and listened. At one point I peaked at his face and was amazed. There was another face sort of like his but different floating in front of his. It disappeared back into Lama’s face. What a surprise! As I stared, it suddenly happened again. I knew this was very special. But if it happened again, it would mean this was most auspicious. Oh, I was excited! The face just floated out toward me, slid off to one side a foot or two and evaporated back out of sight into Lama Yeshe. He continued reading and chanting and I closed my eyes with great happiness and waited until he finished. He dictated a prayer which I copied down, not spelling anything correctly. Afterward, Lama jumped up and said to get Max to take us to Swayambhunath to see a beautiful old lama for his advice. On the way, Lama Yeshe asked me, “What is your question?” I heard myself say I wanted to take ordination and Max almost lost control of the car. When we got there, Lama repeated the question and the wise old lama divined and advised me to meditate on Avalokiteshvara. On the way home, there was a big rainbow across the mountains and Lama Yeshe assured me it was auspicious. That was October 1970. On December 16, 1970, Lama Yeshe arranged for Max and I, Sylvia and Jim to be ordained by Geshe Rabten in McLeod Ganj, Dharamsala, India. M: What was your life like before you ordained? AA: I moved to 12 schools because our family would follow my father from army camp to army camp during WWII. We eventually moved to Vancouver, where I fell in love with skiing. Those were good times because the crowds were small and very social with those on the other mountains. We all started teaching skiing as more people came. And then we started going to Europe. I ended up working in a US Army ski shop in a hotel in Garmisch, Germany teaching at high season and also ski patrolling on the Zugspitze. I’d spend holidays in Switzerland, Austria and eventually discovered Mykonos, Greece where I worked in a shop selling tickets for ships and planes, and enjoyed the beaches and dancing in the bars with friends on my time off. That is where I met Max. She invited me and all my friends to come and visit her in Kathmandu. At Kathmandu Airport I accidently met Zina Rachevsky. 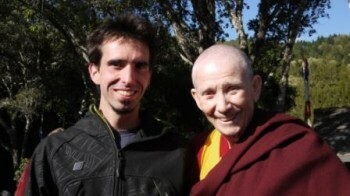 Max had told her about me, so she gave me a ride to Max’s house just in time to meet Lama Zopa Rinpoche at dinner. M: What are your current responsibilities? AA: I don’t have much that I am doing right now except for preparing to get into a long retreat. I had to wait until it was the right time for me to resign from my position as Buddhist Chaplain for the Canadian Federal Government of British Columbia. That finally happened this past June 30, 2010 after 15 years. I loved teaching no matter the classification of the prison. There were seven in the lower Fraser Valley east of Vancouver. As far as teaching goes, it was very unusual to have the same students for less than four or five years. I’ve known most for 10 years and longer. I worked hard to find them really good books. They could devour a book five times between my visits. Their last book was The 12-Step Buddhist by Darren Littlejohn. It brought a big response when it came. M: What challenges have you faced as an ordained women? AA: Well, the challenge for me was taking a good look at my thinking of who and what was in the uniform, and coming to terms with what or who is wearing this uniform and what that means and communicates to people. M: What would you say to women who are thinking of ordaining? AA: I would encourage them to go find out about nuns. You can take rabjung vows – the five lay vows plus one to wear robes – for a brief period and cut your hair. Go live in a community of nuns! Ask your lama to set you up in their good company so you get the taste of being a nun. It’s a life of service, that’s why the robes, the uniform, exist. They won’t let you forget that and everyone will know that you are there for them. Also, I think it matters what your facial expression is portraying to people. Your inner practice is where your work is faced. Let your happiness show. Look people in the eye with a big smile and say “Hello, hi, how are you?” Be ready to assist anybody if they want it. I pretend this living home is a nunnery, looking for the highest good in everybody and ready to assist at any time. Everybody likes that whether they need help or not. Also, “assist” is better word than “help” because people do like to feel they can manage. In fact everyone acts like this. Try to eliminate the negative attitudes, which bring suffering, and increase the positive attitudes, which bring happiness.